Machine learning, an application of artificial intelligence, has been part of Gmail’s spam filter program since Gmail’s inception. On July 9, Google announced three new improvements to Gmail’s spam filter. Every time a user clicks the “Report Spam” or “Not Spam” button on a message, Gmail learns something that helps it filter spam better. But now, Gmail is attempting to learn on its own, without the user’s clicks. The spam filter now uses the same artificial neural network that Google Now and Google Search use to detect and block the “especially sneaky” spam that sometimes slips past users’ radar. What’s an “artificial neural network,” you ask? The oversimplified answer is, a lot of computers connected to each other in an attempt to simulate the interconnections of human brain cells. It’s expensive to build an artificial neural network; most are tiny, with 1 to 10 million connections. Google has built an ANN with over one billion connections using the processors in its vast and far-flung empire of data centers. That sounds awesome, until you learn that the human brain contains several trillion connections! None the less, Google’s ANN is capable of rudimentary human-like self-learning. That means you don’t have to teach it what spam is. In one experiment, Google’s ANN was fed millions of still images of cats culled from YouTube videos. The images were not labeled as “cats” and programmers did not tell the ANN what a “cat” is. The ANN figured it out for itself, learning to recognize cats in virtually any image. If it can do that, it can recognize spam with greater accuracy than most humans can. You don't have to do anything to use Gmail's spam filtering - it's automatic. But you can add your own filters to funnel messages into folders, forward to another address, and other actions. See my article Tame Your Email With Filters for help adding filters to Gmail, Yahoo, Outlook.com, iCloud Mail, or AOL webmail. But the ANN is still not perfect. Just as humans see UFOs in pictures of streetlights, Google’s ANN sometimes sees spam in legitimate messages and mistakenly consigns them to the spam folder. 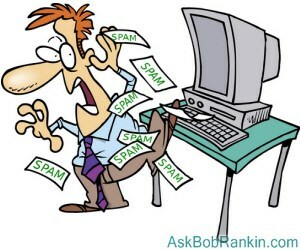 Google claims that only about 0.01 percent (1 in 10,000) of legitimate emails are falsely labeled as spam these days. As the ANN learns more about email, that figure should fall even further. Take a look in your Gmail spam folder, and see how it's working. If you do find certain messages are being incorrectly flagged as spam, you can create a Gmail filter for them, with a "Never send to Spam" action, so they'll be delivered to your inbox. How does Gmail’s spam filter compare to other free Webmail services, such as Microsoft’s Hotmail/Outlook.com and Yahoo? I haven’t been able to find any independent, rigorous studies of this question. I’ll just note that Microsoft seems to think it’s acceptable if less than 3 percent of the messages that reach your inbox are spam. Another new spam-fighting technique that Gmail is introducing doesn’t really tackle spam, in my opinion. Gmail now attempts to learn individual users’ reading preferences and filter out even legitimate mail that goes unread. The company gives the example of email newsletters. One user reads them assiduously while another just lets them pile up unread, or deletes them without reading. Why people don’t just unsubscribe from newsletters is one of life’s mysteries. Hopefully, Gmail can distinguish between legit opt-in email newsletters and the ones that just arrive without your consent. Finally, Gmail is providing help for legitimate, large-volume email publishers whose communications are sometimes wrongly condemned as spam. The Gmail Postmaster Tools will help airlines, banks, credit card companies, and other well-known firms analyze the fate of their emails and improve their delivery and reading rates. Even if you don't use or like Gmail, you can still use it to filter spam. Here's one technique that some people use to "pre-filter" their incoming emails. Instead of providing your actual email address when asked, give out a Gmail address that you've created. Configure that Gmail account to simply forward everything to your actual address. Gmail does spam-filtering BEFORE forwarding, so the messages that do get forwarded are virtually spam-free. Gmail’s spam filter is so reliable and accurate that I hardly ever check my spam filter for false positives anymore. I get hundreds of emails daily, and in 2015, I estimate I’ve clicked on the “Report Spam” or “Not Spam” button less than a dozen times. The spam filter just works. Most recent comments on "Google’s New Spam-Fighting Tools"
Yes, I use Gmail as my primary personal email account now and I like it a lot. It does a great job of filtering spam and only rarely does a good email wind up in the spam folder. It also has some nice extra features like including a "track package" button on shipment emails, and inside the email there is a link on the right to the tracking number. That is especially handy when the email contains only a link back to your account and not the actual tracking info. But who protects us from Google? Google has a terrible record for privacy invasion on nearly every level. I would rather use snail mail than Gmail. EDITOR'S NOTE: Sigh. Who do you know that's had their privacy invaded by Google? I have used Yahoo mail since the late 90's and have found it it only getting worse at filtering over the last several years. I have a high rate of spam (Yes, I do know how to avoid it supposedly!). Yahoo puts good mail into spam so I constantly have to scan the more than 100 spams I get in a day for ones that are in my contacts and used constantly. I also have a Google account that has been used since the early to mid 2000's. I think I have gotten one spam? Tho I have not used that account actively for e-letters/news groups and such until recently. I am in the process of changing many long time accounts over to it. Then I will have a better evaluation of the filters. I also have an iCloud account that I use only for family. It has never had any spam even received that I know of and nothing gone missing in cyberspace that I know about either. (Yahoo has had a number of missing in cyberspace cases). My E-Mail web site is EarthLink ,about 3 years ago they updated security to my E-Mail ,sense then if it is not a recognized from e-mail address ,it goes to my possible spam box ,if their system hints spam &/or etc., they block it and E-mail me not to open it and recaps each day what was possible spam. I've used Gmail almost since it was first introduced, and I guess I take its spam-filtering capabilities for granted. I DO check my spam folder at least once daily, because while false positives are rare, they DO exist, and without checking, I would have missed an important message a time or two. It takes less than a minute to scan the 15 or so spam messages in the spam folder once or twice a day, and it seems prudent to do so. I have no complaints about gmail and spam. It seems to filter very well, though I do get some things passed one time and filtered the next. Regardless, it's a vast improvement over what I had under Groupwise at work. Google's spam recognition is very good, but some of the results seem to be politically skewed. This is understandable; Google's founders and managers are pretty left-wing, and that has to bleed over into their programming even when they're trying not to. But political mail from Republicans often winds up in my spam folder, while political mail from Democrats never does. As a fairly right-wing Libertarian, I have to be careful not to allow Google to always have its way in judging what's spam and what isn't. My wife and I switched from Comcast's e-mail to gMail in January of 2009, mainly because their spam filtering was almost as bad as the HotMail accounts we suffered with, for several years prior to that. Back then, it wasn't unusual for our Inboxes to fill with more spam than legitimate e-mail. With gMail, we were surprised at the difference, being like night-and-day! We immediately recommended it to everyone we knew, for that reason alone. A few joined us, but many had their old accounts for quite awhile and didn't want to deal with the inconvenience of signing up for a new one or sending out a lot address updates. It's a shame so many were willing to put up with the spam aggravation. Over the years, we haven't missed the deluge of baloney and rarely found any e-mails incorrectly routed to the Junk folder. I should note that we almost never go to the gMail site, so don't care about the pluses or minuses of their GUI. We've always used e-mail clients... first Outlook Express, then Windows Mail and now Windows Live Mail. Gmail has nice features, and it would be nice if they all worked all of the time, which is an unreasonable expectation. I download my messages with Thunderbird. My gmail account is set to delete messages that are accessed with POP. Mostly this works; there are only 44 undeleted messages in the Inbox, going back to 24 June. And it's nice that Google emails me a notice telling me I just logged into my Gmail account. Thunderbird puts the notice into its Junk folder, sometimes. "Even if you don't use or like Gmail, you can still use it to filter spam. Here's one technique that some people use to "pre-filter" their incoming emails. Instead of providing your actual email address when asked, give out a Gmail address that you've created. Configure that Gmail account to simply forward everything to your actual address. Gmail does spam-filtering BEFORE forwarding, so the messages that do get forwarded are virtually spam-free." Keep in mind you'll still have to check your Gmail account to insure real emails aren't ending up in your spam folder by accident. Spam is automatically deleted after (I think) 30 days, so you could lose important messages. I don't use Gmail but I'll try it for a throw-away account. netly too paranoid for the 21st century. I've been using Gmail for a long time. I was a 4th generation invitee. On 21 March 2004 they launched with 1,000 opinion leaders, anyone invited that accepted could invite 20 more. So, I would have been in the 80,000 crowd. So, I made it my main mail account. But it was absolute garbage, with tons of spam. I told my friends and relatives to shift back to my regular email. I was going to let my Gmail account expire. If I remember correctly, if you didn't access your account for 30 days your login was suspended and another 30 days were your account will be deleted. You could still reactivate, but all your data are lost. Easy way to clear my account. Somewhere along the line, spam dropped significantly and a lot went to the spam folder, but it still took a long time. In 2007 I got my iPhone but didn't link Gmail to it because it was still full of spam. It became usable after they ended the 5 year beta phase. I agree with Ken M's comment. I find many emails from right wing groups in my junk folder....and I use notmail. Could MS be politcally skrewed? I have used gmail for about 5 years. The only problem I have is they NEVER empty the trash. I always unsubscribe from any newsletter when I no longer find it useful. But it seems that when I unsubscribe my email is passed on to a similar company. does anyone know if it is safe to unsubscribe from the new unsolicited emails? and they are all in the same category of the newsletters I unsubscribed from. I want people to use my own domain email address, not a gmail address. I suppose I could set Gmail to collect mail from my own domain mailbox, then forward it to a different super secret and random-character address in my own domain, and set Outlook to collect it from there. Right? I use Gmail, Hotmail, and others. Gmail has become quite good at excluding spam. Hotmail and Outlook.com can both be configured to exclude anything from your Inbox that is not from somebody who is in your Contact List/Address Book. That is very effective in excluding spam from the Inbox. I am using gmail to filter my regular email address. I have set gmail up to "check mail from other accounts". Then I merely set a filter up to forward the mail from that account to another email address that I have my email client download. Once that is set up, my email client only receives email that has gone through gmail's spam filters. Periodically I go to the gmail account, just to check that gmail has not filtered out any false positives. Something else... if you have your own domain you can create email accounts and have them forward mail to your regular account. This way you can unsubscribe without fear of spam, just delete the address you created. It also lets you trace who is selling your info! My primary email account is with Mail.com. Recently I set up my gmail account to fetch the mail from my Mail.com account. It's great because the amount of spam that I get in my Mail.com account now has been cut down to none -or almost none. Before I had to go to that account and manualy delete all of it daily. And it was a lot! Now the spam is filtered out by gmail. I read my email in Thunderbird and the inbox only has important mail or mail from people I know now. No spam! It's great not to be annoyed by spam every day!